Port of EDoom to the SonyEricsson P800/P900 (Symbian OS version 7). 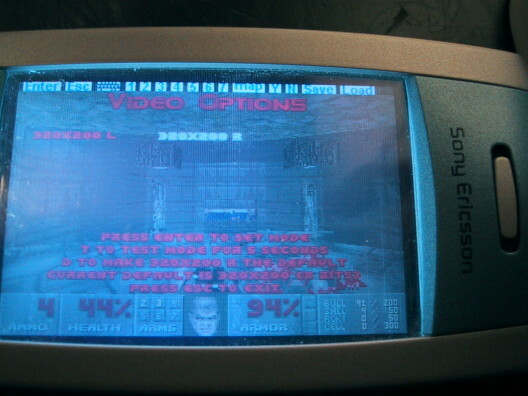 This time the port is more complete, game safe/load works, it has 8 channel sound support and can be configured to either rotate the screen to the left or right. Latest version of EDoom for the P800/P900 is 1.4. Download the .SIS file and install it on the P800/P900 as per normal. Also read the comments below on WAD files. Rebuilt EDoom with version 1.2 of ECompXL. Fixed "access denied" error during uninstallation. Sometimes you can still get an "In use" error; just reboot and retry the uninstall. Latest source code is released under the GNU General Public License (GPL). Unzip the EDoom source code. 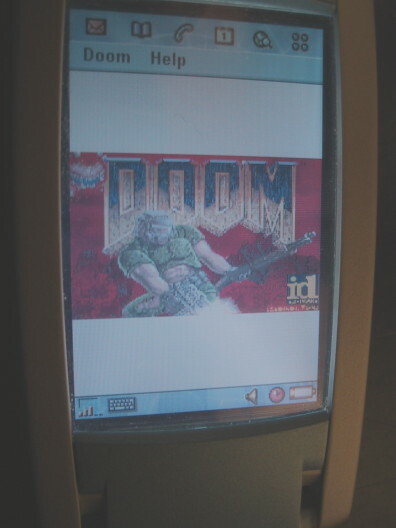 Change directory to \doom\doomapp\group and build the project edoom. 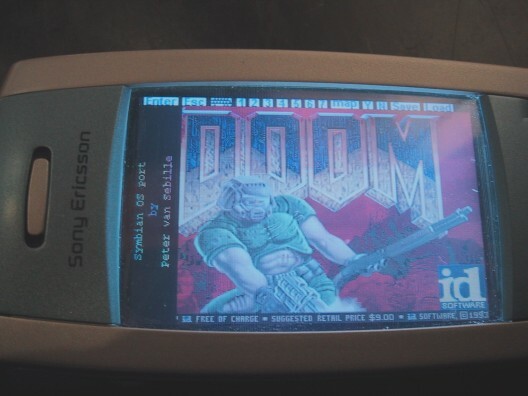 Change directory to \doom\epoc\group and build the project doom. 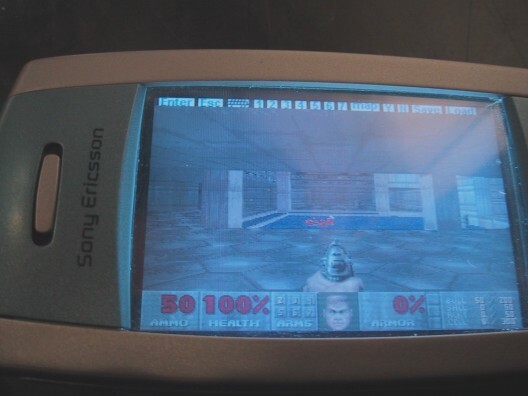 Just as for EDoom for the Psion devices, the P800/P900 version of EDoom doesn't come with the original WAD files. Again, doom1.wad and doom3.wad is probably what't you're after. So, be creative! Buy a copy of Doom, search for them on the net or "borrow" them from your Dad (afterall, Doom is pretty old ;-)). Essentially I don't care as long as you're not going to mail me asking for a copy. Once you have them, store them on the P800/P900 in the folder called DOOM under Document. No project without screenshots nowadays, so here goes. This is the EDoom frontend from which you start EDoom. When started you get the EDoom's splash screen. Choose single player game from the menu and you get here. 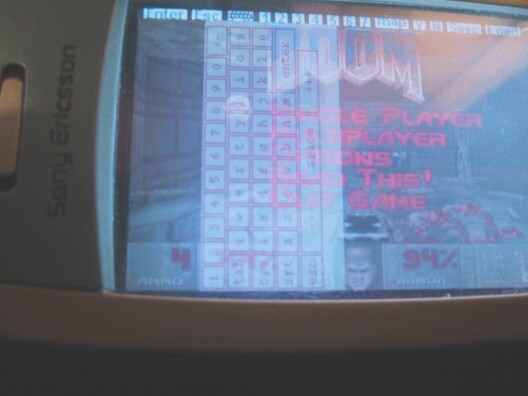 EDoom is 320x200 and you may configure it to be rotated to either the left or the right.You can also save & load games; when saving a game, you can use the on-screen virtual keyboard, conveniently alpha-blended with the Doom scene. Move the stylus up / down to go forwards / backwards. Move the stylus left / right to turn left / right. When moving left / right at the same time as forwards / backwards the left / right delta movement is done in smaller increments to prevent jitter. Strafe left / right when moving forwards / backwards to make a big turn in that direction. Strafe left/right: Jog dial up/down. Look up/down: Jog dial left/right. Other: Use the on-screen virtual keyboard for alpha-numeric input when needed (for example when loading / saving a game). Commonly used keys like ENTER, ESC, Y and N, and 1-6 for switching weapons are also included on the toolbar. Configuration: You can change the key / button assignments as per normal via the menu (Options -> Setup Controls). The P800/P900 specific keys have been mapped to keys A-G.